At this year’s NJSEA Leadership Matters Conference, the nomination of new officers took place. Unanimously, the positions for President, Vice President, and Secretary were decided.This coming summer, Jessica Quijano will move from her current position as Vice President to State President, and Anthony Elia will move up from Secretary to Vice President. A new ambassador and dedicated educator, Daniela Ceballos will become the new state Secretary. Someone once said, “Leadership is action, not a position.” I am honored to be the incoming President of this exceptional organization, and I will let me actions as your leader speak louder than my words. Together, we can rise strong. Together, we will share our passion for education. I want to thank everyone for continued support and giving me this opportunity to continue to serve you. NJSEA has become a second family to me, and I enjoy working with each and every one of you. 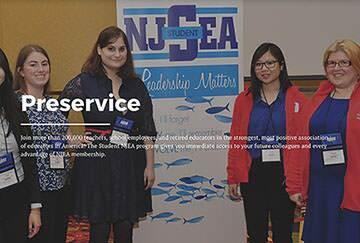 I hope to bring NJSEA to new heights, bringing more members to our preservice branch of the union. I look forward to another great year in which we will continue to rise strong. I am honored to be the incoming Secretary for NJSEA. Diversity is great because we are able to learn so many different ideas from one another and learn to accept everyone, and NJSEA is definitely diverse. This helps us grow as individual people and as an organization. I look forward to learning and growing alongside so many dedicated preservice members.